The Magical Map is a special treasure map in Paper Mario: The Thousand-Year Door. Prior to the events of the game, four heroes used the Crystal Stars to defeat the Shadow Queen, and after she was defeated, the Crystal Stars were hidden and kept in separate safe locations. The Magical Map was then created to help the heroes locate the Crystal Stars should they be needed again. The map was then locked in a small chest and was enchanted so it could only be opened by the pure hearted, so evil could not use it. Additionally, the heroes locked the Shadow Queen and her followers behind a large door, which was enchanted to only be opened with the Crystal Stars. A pedestal in front of the door will show the locations of the Crystal Stars on the Magical Map if one stands on top of it with the map in their possession, with the Crystal Stars aiding in locating the next one. A millennia later, Princess Peach and Toadsworth stop at Rogueport to refuel their boat. During this time, a merchant noticed Peach and asked if she'd like to buy something. Princess Peach noticed a small treasure chest and the merchant said she could have it provided she is able to open it, as the chest will only open to those who are pure hearted. After the merchant demonstrated that she could not open it, the chest is given to Peach. Peach is able to open the chest, which shown a bright light upon being opened, and Peach found the Magical Map inside. Overjoyed by her discovery, Peach sent Mario a letter telling him about Rogueport and the map, additionally sending the map to Mario and telling him to meet her at Rogueport. Once Mario makes it to Rogueport and finds The Thousand-Year Door, he stands on the pedestal with the map in his hand, which reveals the location of the first Crystal Star to be in Hooktail Castle in Petal Meadows, the first stop in Mario's latest adventure. The X-Nauts and the Shadow Sirens would try a few schemes in order to take the Magical Map from Mario's possession, but all of them would fail. 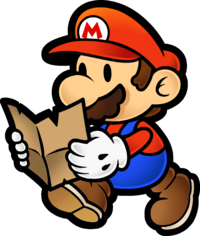 On the game's menu, the map is used to show Mario's current location as well as give a brief description of places the player has visited. Additionally, the Magical Map is shown whenever Mario uses a Special Move during battles. It has been requested that additional images be uploaded for this section. Remove this only when the image(s) have been uploaded for this section. Specifics: Where it is used, sprite, etc. The box that contains the Magical Map being opened. When the Magical Map is on Professor Frankly's desk (at any time in the game), all shown locations of where the Crystal Stars are can be seen. A Nibbles can be seen on the map. This page was last edited on April 24, 2019, at 20:28.